Getting paid and staying organized are particularly challenging for project-based businesses, such as designers and contractors, who often have long gaps between paydays and little consistency between assignments. Scratch that. It used to be challenging. 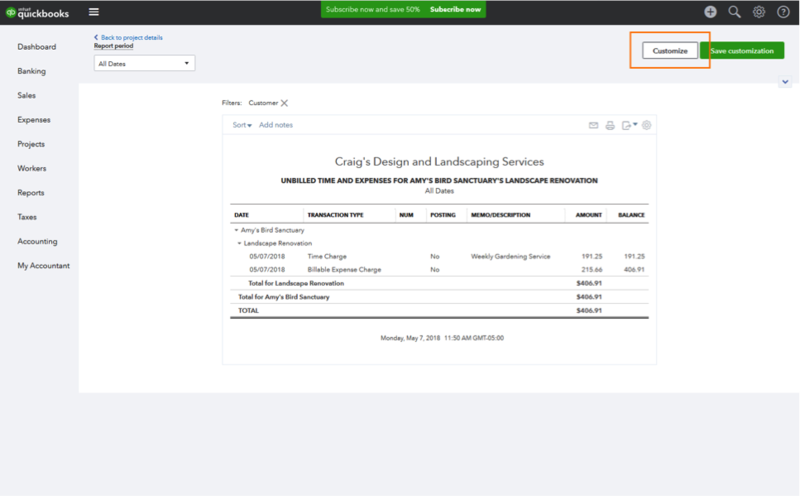 We’re thrilled to announce two of our latest updates to QuickBooks® Online — our Projects tab and Progress Invoicing option — designed specifically to help your project-based clients easily stay on track and regulate cash flow. Please note that Progress Invoicing can be used in QuickBooks Online Simple Start, Essentials or Plus. It can be used alone or with Projects, which is only available in QuickBooks Online Plus. Here’s what you need to know about using these features. No two days or two assignments are the same for project-based businesses — but that doesn’t mean managing these projects should be as unpredictable. With our Projects tab, your clients now have one central hub where they can create projects and manage and track all of the transactions and activities that go along with them. That way, even though the work is constantly changing, the way to organize it stays the same. The Projects tab also lets your clients gain more clarity into the work they’ve done. 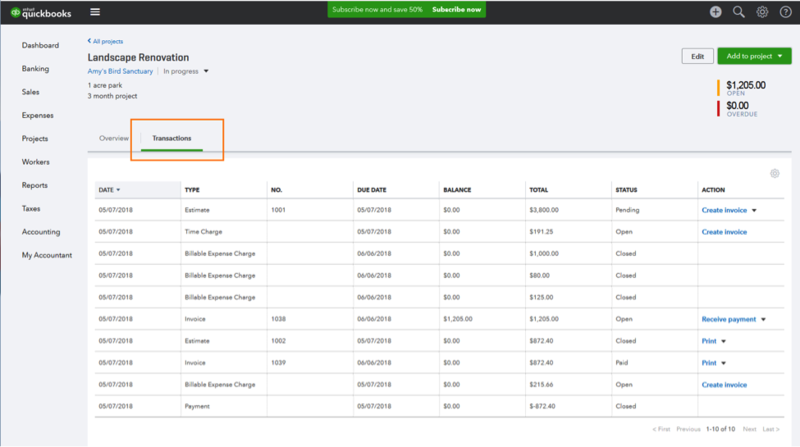 For example, we’ve made it easy to run a profitability report with one click right in QuickBooks; clients no longer have to waste time manually customizing reports to understand how much they earned or lost on their last project. 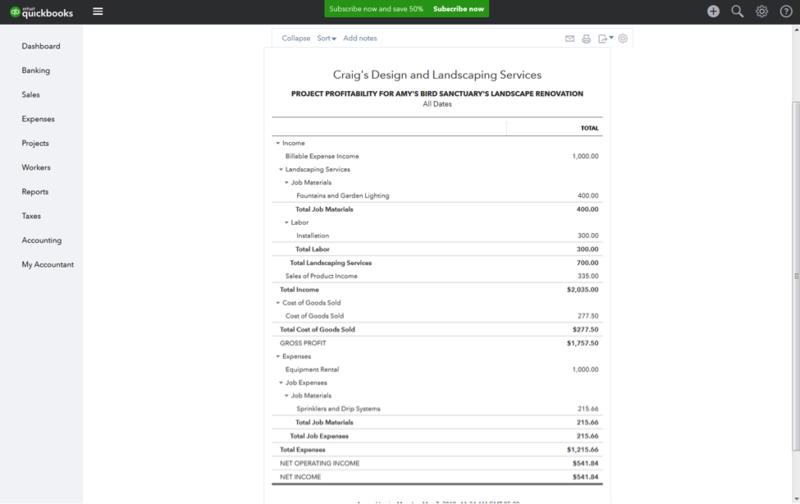 Tag invoices, expenses, timesheets, bills, payments, and other transactions to the customer and their project. Run a profitability report with one click. 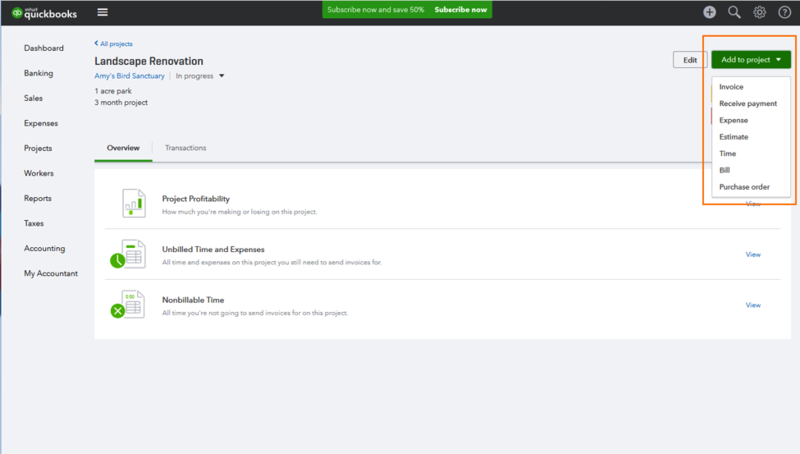 See outstanding billable expenses and time. Take notes and mark a project completed when finished. 1. Under the Gear icon, select Account and Settings. 2. Select the Advanced tab on the left panel. This will add a Projects tab on the left navigation panel. When opened, you’ll be prompted to add the first project. 4. 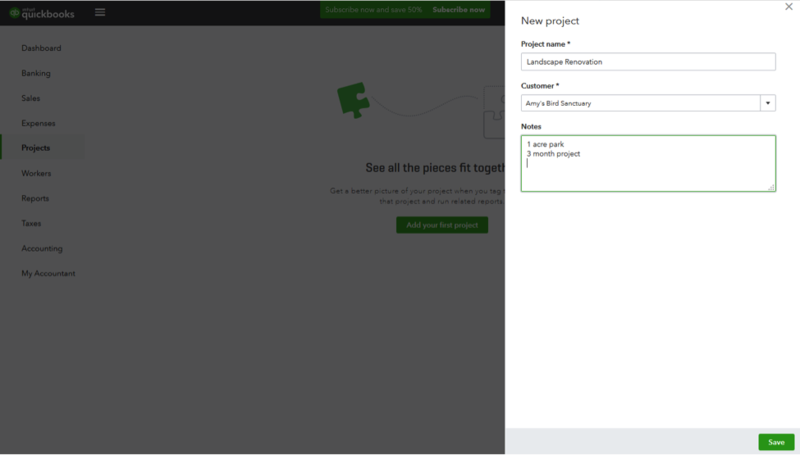 Name the project, indicate the customer, fill in notes (optional), and click Save. 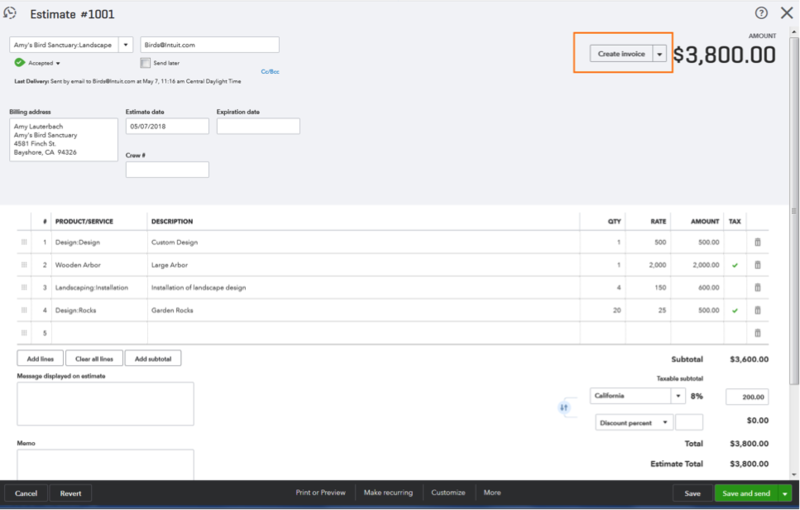 Once you create projects, you can quickly access them from the Projects tab in the left navigation panel, or the tab of the same name within a customer’s profile. 1. Begin creating transactions and logging time for the project. You can do this quickly from the Add to Projectmenu in the upper right. 2. 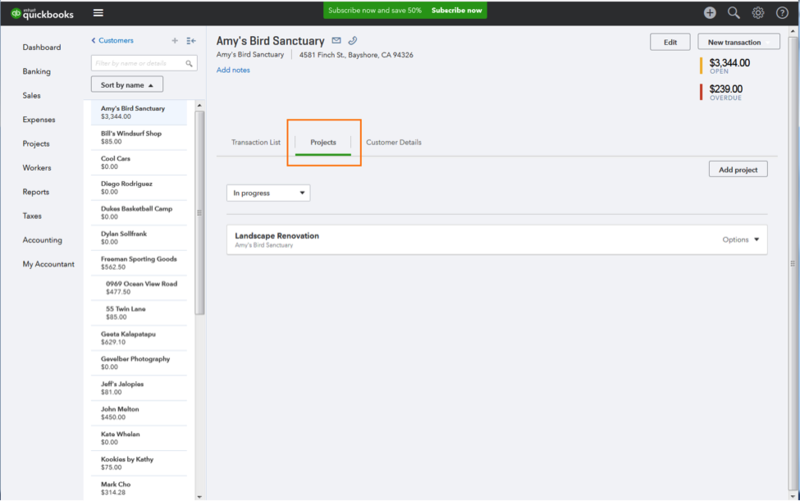 If you create a transaction from elsewhere in QuickBooks later (such as the Create (+)menu), you’ll be able to select the project the same way you would normally choose a customer. Projects show as sub-items below the customer name, as seen below. 3. When you’re working in a project, toggle to the Transactionstab to see a list of the associated transactions and billable time/expenses. 4. 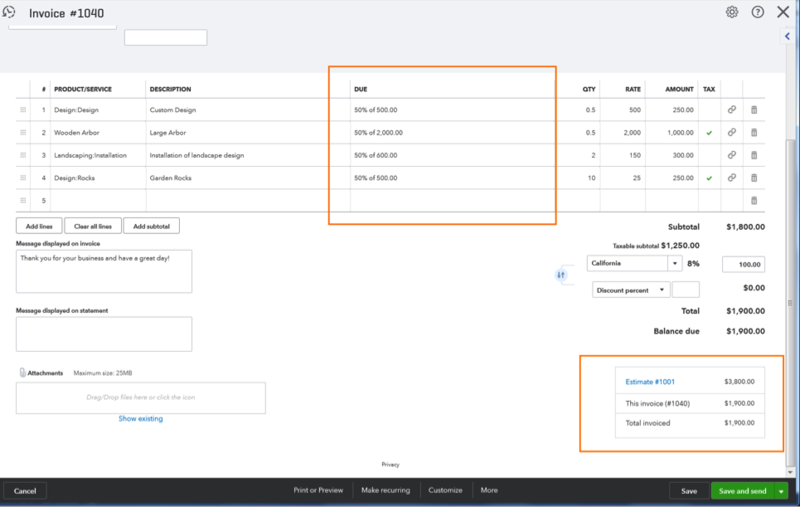 Toggle to the Overviewtab to quickly run reports, such as “Project Profitability,” which is a profit and loss report pre-filtered for each specific project. You can run other reports, too — such as those on billable time and expenses, and non-billable time. 5. 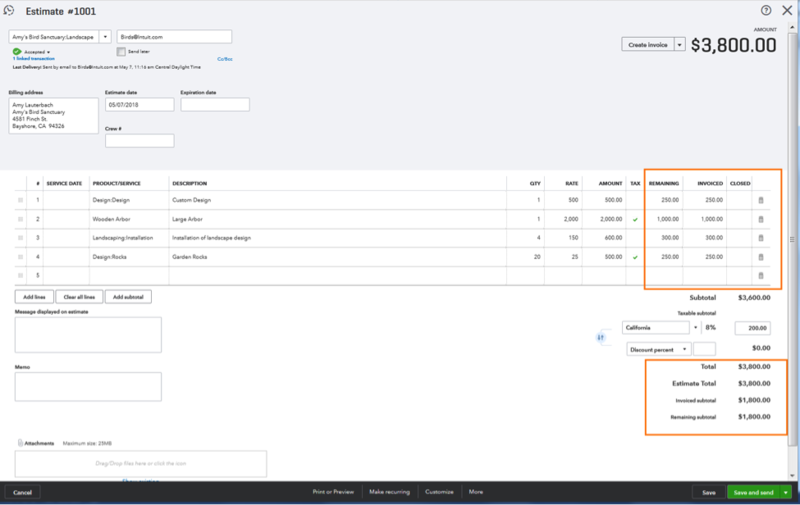 Select Customize in the upper right to make changes to reports, such as adding a column for “Employee,” for example. 6. Once a project is complete, you can update the status in the Options drop-down on the right. Waiting until the end of a long project to get paid puts a lot of stress on your clients’ bank accounts — not to mention their minds. Thankfully, QuickBooks Online now allows your clients to use Progress Invoicing and bill their customers incrementally to keep cash coming in during ongoing projects. In Full: the total amount of the estimate. Partial: pre-calculated percentage of the estimate. 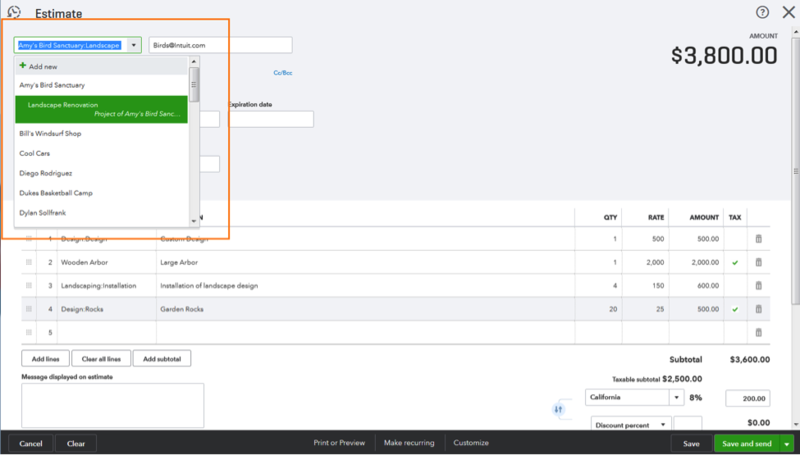 Custom:amount you choose based around certain project milestones or other criteria. 1. Under the Gear icon, selectAccount and Settings. 2. 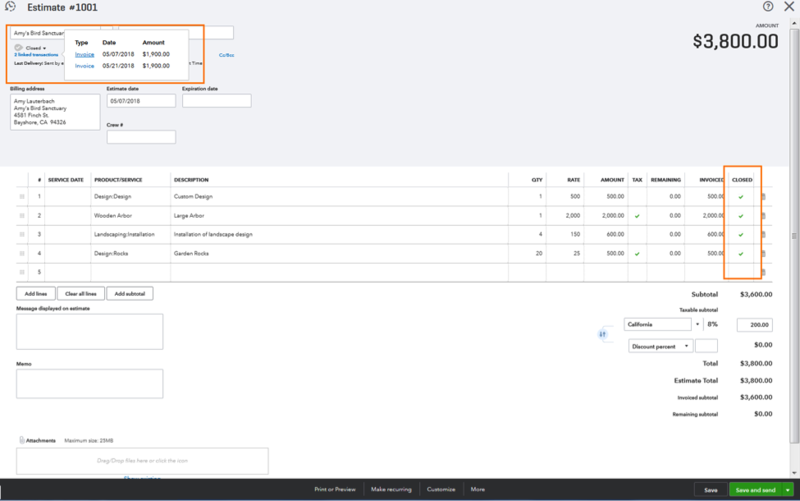 Select Sales from the left navigation panel. 3. Turn on Progress Invoicing. Note: This feature may be turned on by default in some accounts. 4. 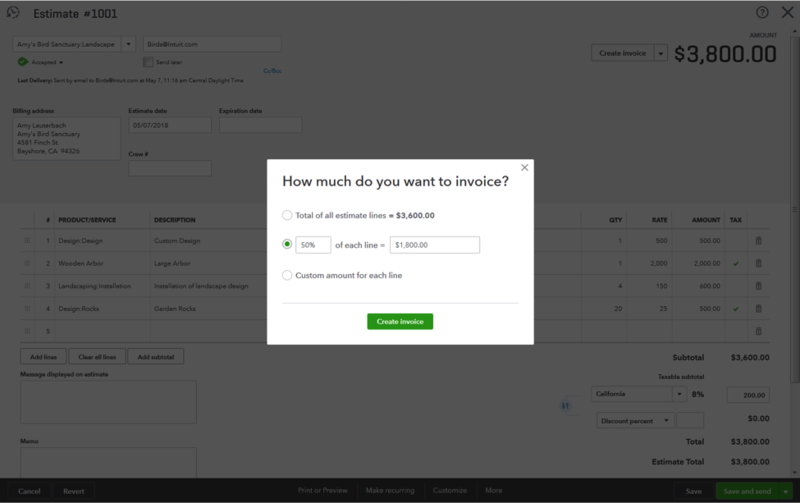 To use Progress Invoicing, select Create invoice within the project’s existing estimate. 5. 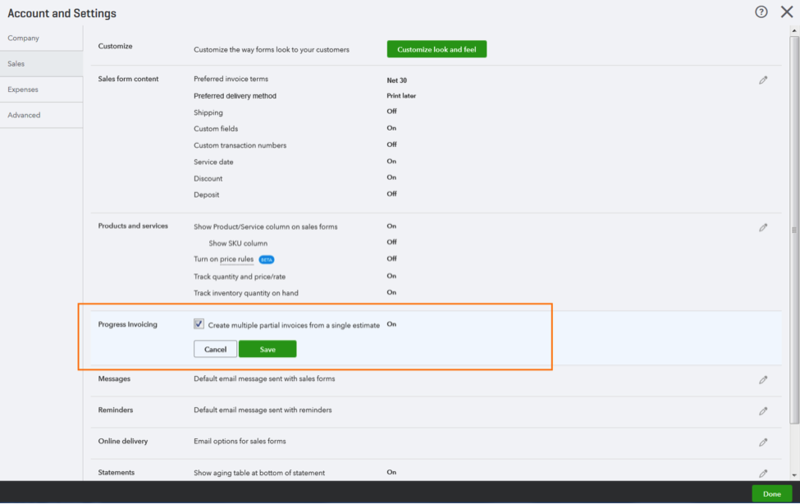 A box will appear asking which invoicing method you want — the full amount, partial percentage, or a custom amount. 6. Let’s say the client would like their customer to pay 50% of the estimate on the first invoice. Select the partial percentage option, fill in “50%” in the first box, and click Create invoice. 7. 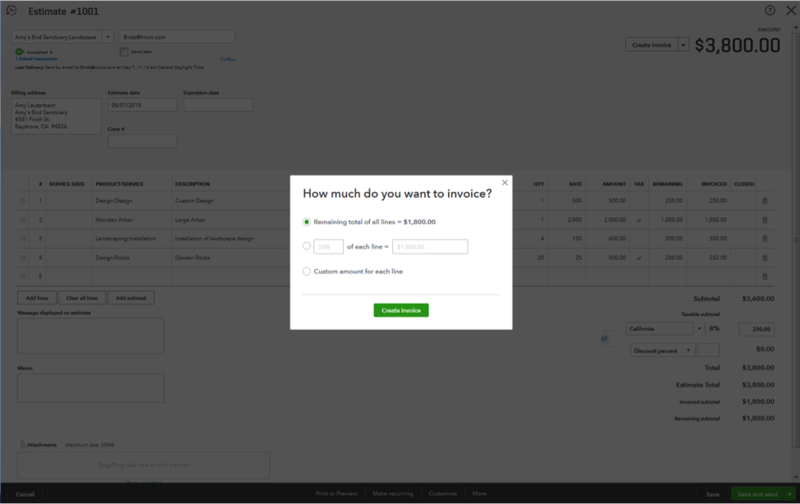 QuickBooks will automatically calculate the payment amount, and a “Due” column will show in the invoice. In the lower right, you’ll be able to see the progress made toward the total estimate. You’ll be able to see the same progress section when you return to the estimate screen. 8. Let’s say the same client is creating their next invoice. They’ll be able to bill for the remaining balance, or again choose a percentage or custom amount. 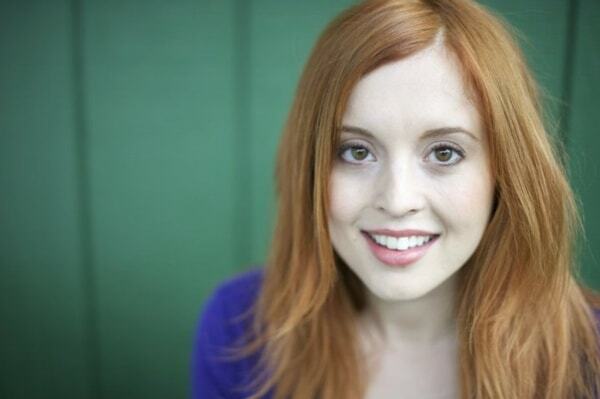 For example, a client might decide to do 50% on the first invoice, then 25% on the next, and so on. Or they can choose to customize their own dollar amount by line, based around completing a major project milestone, for example. Whatever method they choose, make sure your clients set clear expectations with their customer. 9. 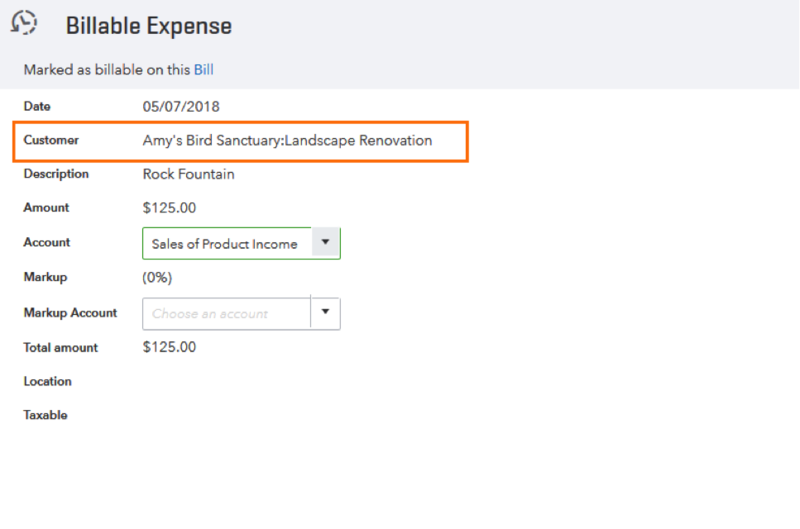 As you create additional invoices, you’ll be able to see how much of the total estimate remains until eventually the remaining subtotal will show $0.00 and the estimate will be automatically marked closed.